It will take planning and forecasting for Vesey to determine his next move. The soon-to-be Harvard graduate has never minded doing his homework. Jimmy Vesey attended a reception last week at the Harvard Club to recognize the 2016 Hobey Baker Award winner. As a father and former NHL player, Jim Vesey has difficulty practicing patience when it comes to anticipating his son’s professional career. But as a father and former NHL player, Vesey understands a dream deferred has allowed his son to assume a powerful position. 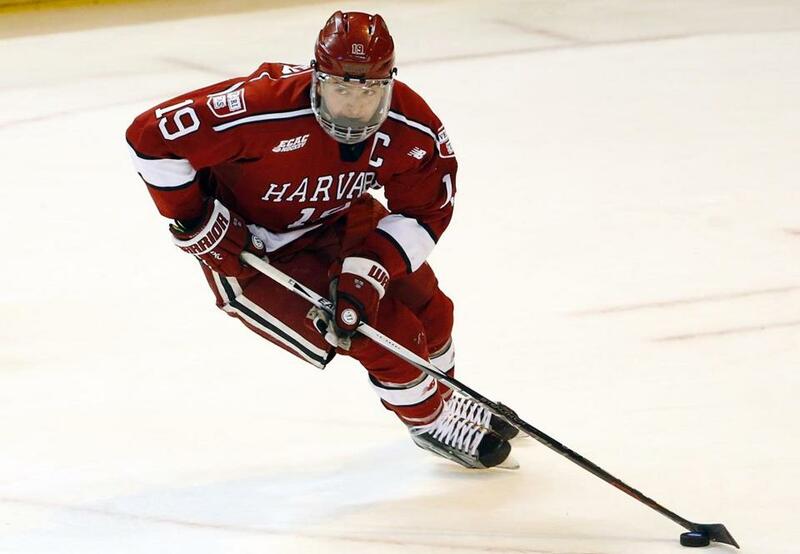 On May 26, Jimmy Vesey will graduate from Harvard. On Aug. 15, Vesey, Nashville’s third-round pick in 2012, will become an unrestricted free agent. Vesey, who turns 23 the day he graduates, will choose where he wants to play pro hockey — a privilege that Patrice Bergeron, a potential future teammate, has never enjoyed as an NHLer. Father and son attended a reception on Monday at the Harvard Club to recognize Vesey, the 2016 Hobey Baker Award winner, as well as the school’s three other recipients of the NCAA’s signature trophy: Lane MacDonald, Scott Fusco, and Mark Fusco. Of the four, Vesey projects to make the loudest impact as an NHLer. For the last two years, the left wing was one of the best collegians. When Vesey controlled the puck, his expansive toolbox allowed him to snap off in-stride shots, pick through traffic to get closer to the net, or draw defenders and create scoring chances for his teammates. As a junior, Vesey had 32 goals and 26 assists. As a senior, he punched in 24 goals with 22 assists. 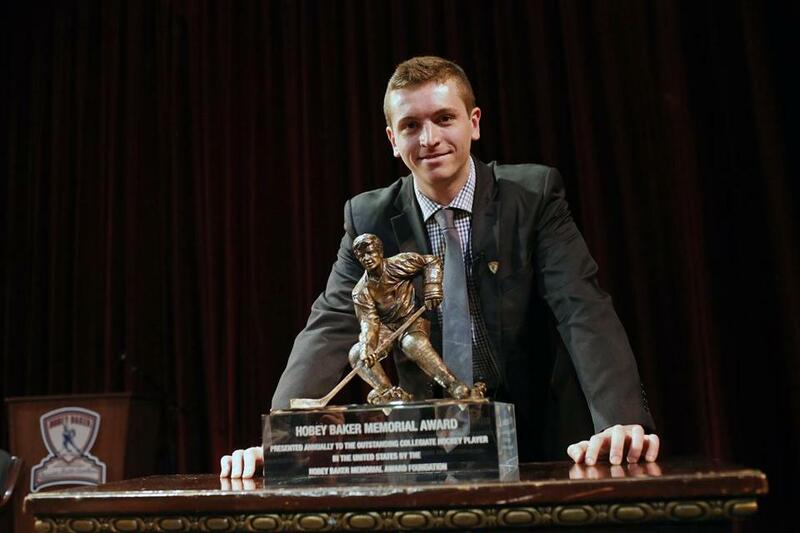 The award that eluded him in 2014-15 accompanied Vesey at the Harvard Club. Vesey was good enough for Nashville general manager David Poile to guarantee the senior a roster spot for the end of the regular season and the playoffs. But Vesey informed the Predators he was not interested in signing. Vesey wanted to choose his destination, which any collegian can do four years out from when he was drafted. He also wanted to experience his final days as a student. Two franchises will build their teams with Jimmy Vesey in mind: Toronto and Boston. By now, Vesey has completed his final college assignment: a sociology paper. He will enjoy Senior Week activities with his classmates, teammates, and friends. Then on May 26, Vesey will receive his Harvard diploma. It’s a tool that will take him a lot further than his left-shot stick. This summer, Vesey will work out in Foxborough in preparation for his first pro training camp, wherever it may be. With assistance from agent Peter Fish, Vesey will monitor the playoffs, draft, and free agency to select his future employer. By Aug. 15, when Vesey will be free to negotiate with any NHL team, rosters for 2016-17 will be close to set. Most go-to free agents will have signed by then. Two franchises will build their teams with Vesey in mind: Toronto and Boston, the favorites to land the Charlestown native. The Bruins would like a second- or third-line left wing to complement Brad Marchand and Matt Beleskey. The Maple Leafs, who employ Vesey’s father as a scout and drafted younger brother Nolan Vesey in the sixth round in 2014, are interested in every young player who can skate and shoot. It was a wild first AHL season for Jay Leach. Between Boston, Tampa Bay, New Jersey, Montreal, and San Jose, Jay Leach appeared in 70 NHL games, an achievement worthy of a stick salute. That 70-game compilation did not come naturally for the four-year Providence College defenseman. Leach comes from rich hockey stock. Uncles include ex-Bruin and former Matignon star Stephen Leach, and longtime NHL assistant coach Jay Leach. 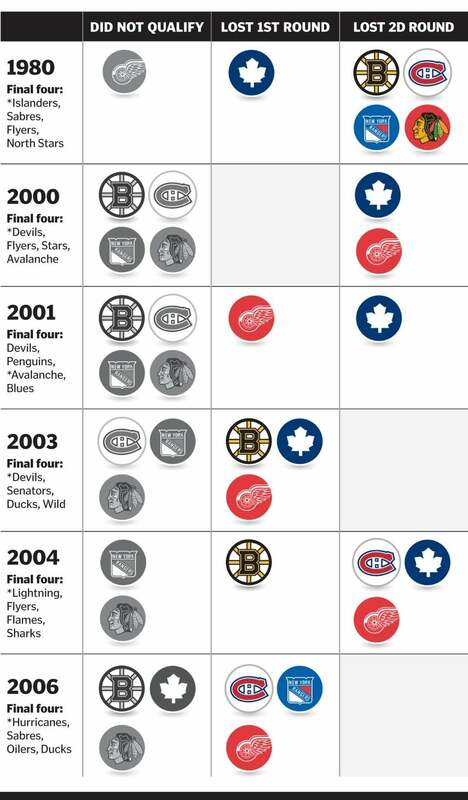 But good bloodlines do not guarantee NHL results. As athletic and smart and trustworthy as he was in the AHL, Jay Leach had to apply his processing power to maximum capability for every NHL shift. The 36-year-old Leach got lucky. He concluded his playing career in 2012-13. Three seasons later, he is one call away from landing in Pittsburgh alongside short-term boss Mike Sullivan. That Leach got to his current position required fortune and faith. The former came via Matt Keator, Leach’s agent as a player. In the summer of 2014, Keator was speaking with Geoff Ward. Claude Julien’s former right-hand man had accepted a job with Mannheim of the Deutsche Eishockey Liga. Ward wanted an assistant to run the defense. Keator knew Leach would be interested. The connection paid off when Ward and Leach clicked, the latter reminding the former Bruins assistant of ex-colleague Doug Houda. There was one drawback: The gig was in Germany, an ocean away from Leach’s preferred destination, in a 100-foot-wide game that did not resemble the North American style. Leach had to trust that his first coaching job overseas would include a prompt return ticket. Leach could not have asked for a better start. Mannheim won the DEL championship. New Jersey then hired Ward to be John Hynes’s assistant. When Sullivan landed the Wilkes-Barre/Scranton job, he needed an assistant. Leach’s results in Germany helped convince his former coach — the defenseman played two games for Sullivan in Boston in 2005-06 — he would be a good bench companion. Ward’s instruction and recommendation went a long way, too. It’s been a wild first AHL season. On Dec. 12, 2015, the Penguins promoted Sullivan. 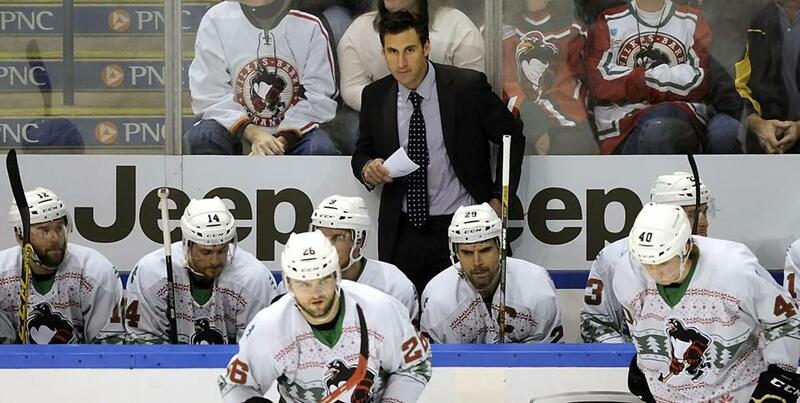 Clark Donatelli moved up from Wheeling of the ECHL to replace Sullivan. Prospects Matt Murray, Conor Sheary, and Derrick Pouliot said goodbye to the AHL. 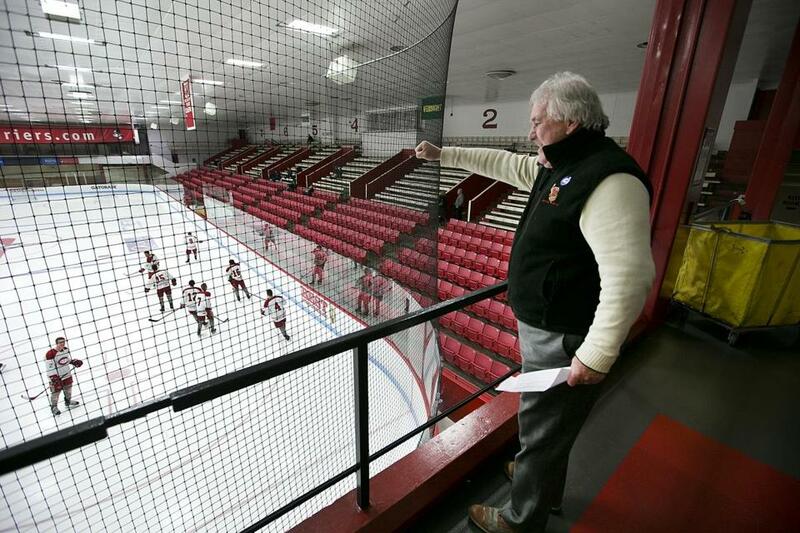 Bill Hanson will be honored on May 20 at BU’s Agganis Arena. Ted Donato has been Harvard’s coach for 12 years. He played in 796 NHL games, including 528 for the Bruins. As a Harvard sophomore, Donato scored 51 points to help the Crimson win their only NCAA title. Bill Hanson, Donato’s high school coach at Catholic Memorial, played a big part in helping his former pupil fulfill his later achievements. Donato and his fellow ex-Knights will honor Hanson on May 20 at BU’s Agganis Arena. Proceeds will benefit the Mark Bavis Leadership Foundation and the Massachusetts Soldiers Legacy Fund. For tickets, visit Event Brite here. Former Knights expected to attend include Donato, Mike Bavis, Jim Carey, Jim Fahey, Jeff Kealty, Chris Nilan, Chris O’Sullivan, Kevin O’Sullivan, Tom Noble, Mike Prendergast, Chris Rooney, and Brendan Walsh. Like other former CM students, Donato also considered Boston College High. But he followed older brothers Chris and Dan to CM. 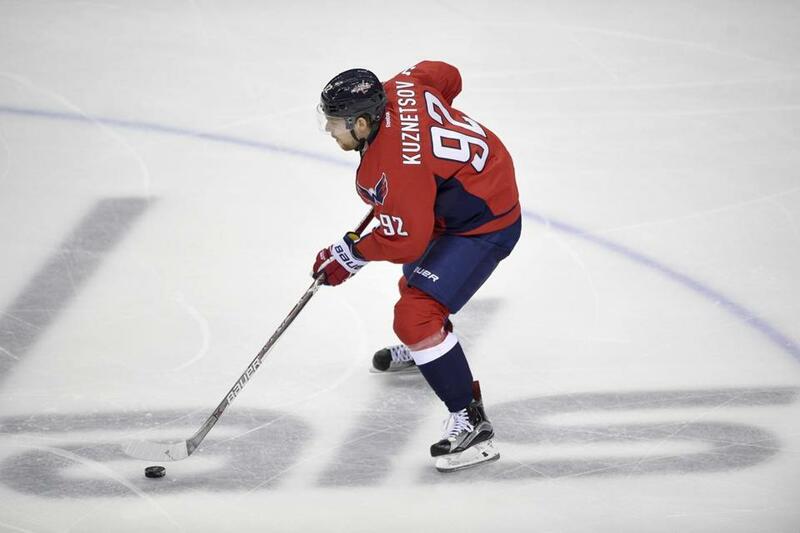 Evgeny Kuznetsov had one assist in his team’s six-game flameout. Had the Capitals gotten any kind of offensive presence from Evgeny Kuznetsov, they might have found a way past the Penguins. Instead, Washington’s No. 2 center had just one assist (a secondary one, at that) in his team’s six-game flameout. Coach Barry Trotz tried everything to ignite the skilled pivot, including putting him between Alex Ovechkin and T.J. Oshie in Nicklas Backstrom’s usual spot. Kuznetsov could never replicate the threat level he raised during the regular season, when he led the Capitals with 77 points. Against Pittsburgh, Kuznetsov especially struggled during five-on-five play. The 23-year-old learned the hard way that checking becomes much tighter in the playoffs. Calgary would be best served giving Nate Leaman a look for its coaching vacancy. The Providence College coach, who led the Friars to the NCAA championship in 2014-15, could be the next ex-collegian to follow Dave Hakstol’s model in Philadelphia. Under Leaman, Noel Acciari and Brandon Tanev played well enough to earn jobs with Boston and Winnipeg via free agency. Leaman has existing ties with the Flames. He coached Josh Jooris at Union College. Ex-Friars Mark Jankowski and Jon Gillies are bidding for NHL work. Flames president Brian Burke is a Providence graduate. Ryan Nugent-Hopkins might be a player of interest for Bruce Boudreau and the Wild. The Wild were already in the market for a center. Their search will amplify following the arrival of Bruce Boudreau. The ex-Anaheim coach got results with the Ducks, partly because of his team’s 1-2 center punch of Ryan Getzlaf and Ryan Kesler. Boudreau would like a similar setup in Minnesota, where Mikko Koivu is becoming more suited for matchup play than offensive production. The Wild have depth on defense. The Oilers do not. 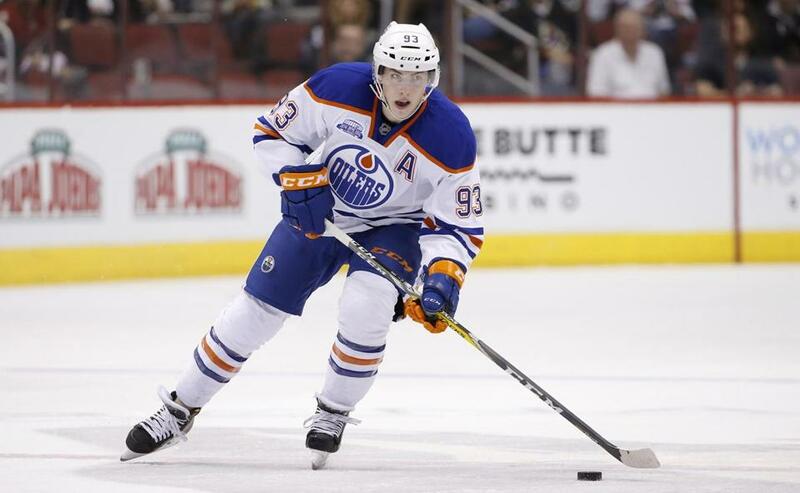 Ryan Nugent-Hopkins might be a player of interest for Boudreau and Wild GM Chuck Fletcher. In turn, with Connor McDavid and Leon Draisaitl in place, Edmonton is in a position of strength at center. This may be the time for the Oilers to deploy Nugent-Hopkins as trade collateral to improve their defense. Erik Karlsson is one of the best players in the league because of his ability to turn defense into offense, push the pace, and threaten to create goals on every shift. As Ottawa’s new coach, Guy Boucher has no intentions of deploying his Bugatti Veyron as a soccer practice shuttle. “What we have here is an unbelievable offensive defenseman,” Boucher told Ottawa reporters on Monday. “He is the best in the league. We’ve got to cherish that and we’ve got to respect that. He’ll drive the team with his strengths. I don’t want to change that. Absolutely not.” Karlsson will continue to be Ottawa’s offensive catalyst at even strength and on the power play. If Boucher believes he has better defensive alternatives, he will deploy them as he sees fit instead of asking Karlsson to do things — box out forwards, grind in the corners — that are lesser parts of his game. Boucher recognizes he has a unique piece. He plans to take advantage of it. 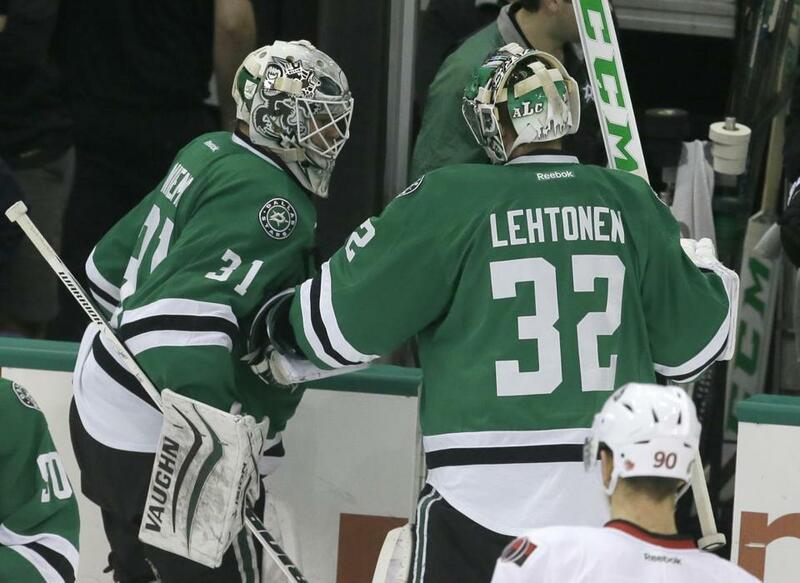 Kari Lehtonen and Antti Niemi are under contract for two more seasons at a combined annual cap hit of $10.4 million. Dallas GM Jim Nill is in a tough spot with his goaltending. Kari Lehtonen and Antti Niemi are under contract for two more seasons at a combined annual cap hit of $10.4 million. Nill, formerly Detroit’s assistant GM, may consider Jimmy Howard an upgrade over both goalies. But it would take some maneuvering to move Lehtonen or Niemi to make room for Howard, who otherwise projects to be Petr Mrazek’s backup . . . The Panthers chose to re-up Erik Gudbranson to a one-year, $3.5 million deal instead of extending the right-shot defenseman long term. This indicates the Panthers aren’t sold on the Gudbranson, despite his 26:54 of ice time per game, highest of all team defensemen, in the first round against the Islanders. The 24-year-old Gudbranson, picked third in 2010 after Taylor Hall and Tyler Seguin, is of the age where high-end defensemen sign multiyear contracts . . . Benoit Groulx, longtime junior coach in Gatineau (former charges include David Krejci and Claude Giroux), is back in the AHL. Groulx replaces Rob Zettler in Syracuse, Tampa Bay’s AHL affiliate. Groulx worked for the other Florida team during his last AHL stretch, when he coached Rochester, then the Panthers’ farm team . . . Islanders GM Garth Snow got good news on Tuesday when Travis Hamonic withdrew his trade request from earlier in the year. The health of a family member, poor when Hamonic wanted out, has improved. Snow practiced patience by not dealing Hamonic for the sake of dealing him . . . Congratulations and best wishes in retirement to former Park School hockey coach Bob Tisi. Tisi, father of Bruins video judge Rob Tisi, taught hundreds of Park players to keep their heads up and elbows sharp.